The bad-weather day and my rest day were over. The last of the rain was out of the area before midnight, replaced by windy mild air under partly cloudy skies. The full effect of the coming Canadian airmass wouldn't get here until tomorrow, so today was a transition day weatherwise. As you can see from the photo above, taken from Mt. Pierce, Mount Washington was still scraping the clouds most of the day. It did clear up, right when I was at my turn-around point where the Webster Cliff Trail ends and the AT takes up the venerable old Crawford Path. You can see all the towers on the summit in the view at left. 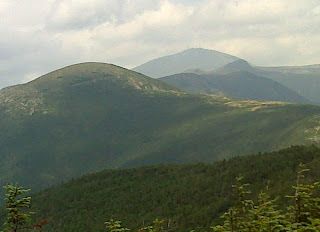 The closer-in peak is Mt. Eisenhower. 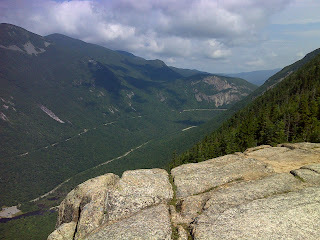 The other end of the Webster Cliff Trail is down in Crawford Notch. And the climb up is dang tough! There's one piece of bedrock scrambling that's the steepest 30 foot climb anywhere on the trail, as far as I recall. Otherwise there's lots of rock scrambling ... and this bit of trail would be heaven for the hiker who loves wind in their face, views over a brink where the land below your feet is out of sight (so it's just you and the vast chasm of Crawford Notch). 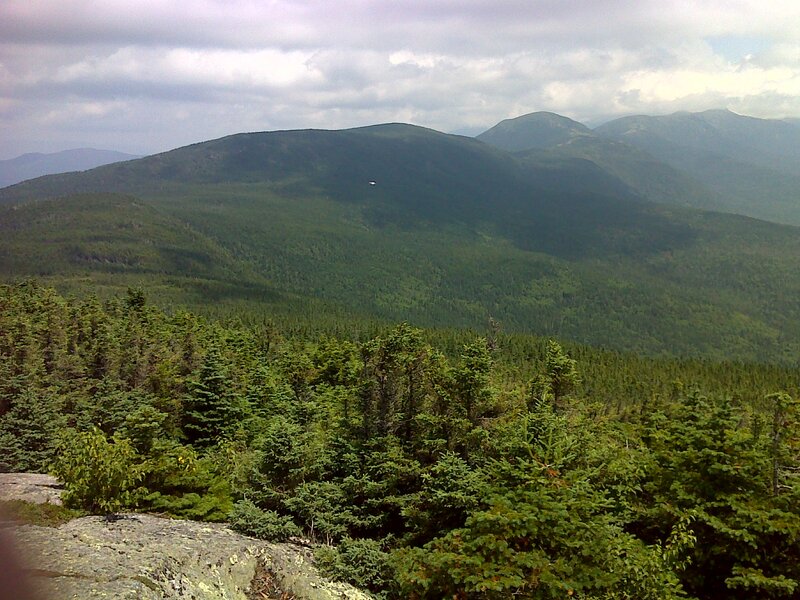 I counted fourteen such open, cliff-top viewpoints ranging from about the 3000 foot level on up to the 3800 foot summit of Mount Webster. 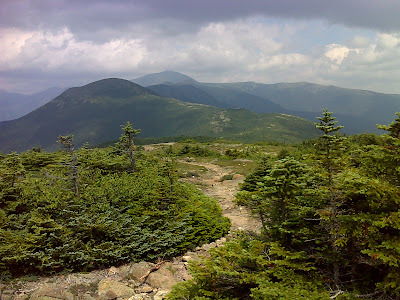 Then the trail gets easier, by White Mountain standards. It meanders through a saddle between Mt. Webster and Mt. Jackson with level trail punctuated by little gnarly rock scrambles, up or down, seemingly at random. 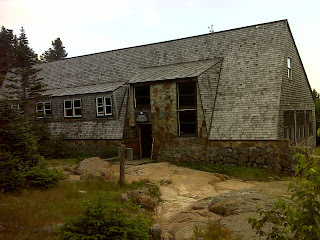 Then from Mount Jackson's open summit you get to see the walk you are about to make through the next saddle, which features some board walking through a boggy area, and the Mizpah Springs Hut, gleaming on the far slopes directly below my third summit of the day, Mt. Pierce. Mizpah Springs Hut is unusual in that there's no view from the building itself. It just sits in the pristine woods with its multi-level construction. Inside it's welcoming and 'clean as a whistle'. Today it was pretty quiet there at midday. If you want views at Mizpah, you don't have to go far. Just scramble steeply up toward Mt. Pierce and you come to a nice rock outcrop in less than a quarter mile. Then its on across a bit of a saddle to the actual summit and the view shown up top. It was a hard eleven-hour day, but sets me up for my first Mount Washington summit assault tomorrow (the south side). Weather looks windy and cold up there - in the 40's all day. I just hope the clouds and fog keep their distance.